Finish: the ID finish of ball and ports are to a 25 Ra ID. Sanitary Solutions is your source for a T304 Dual Purge Port Ball Valve to service the Brewery, Beverage, Winery and Tank Industries. 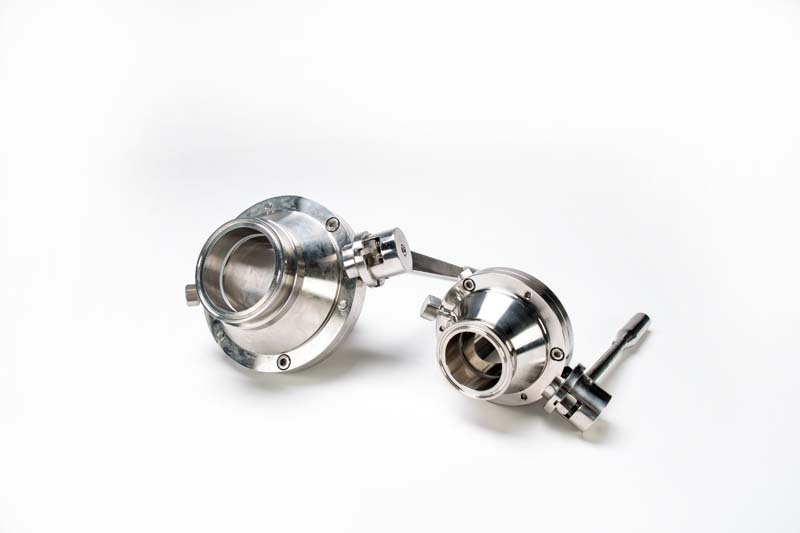 Our dual purge port ball valve is designed to be fully drain able with (2) PURGE PORTS provided to take a sample and can be used in CIP applications and able to maintain a full flow rate with a minimum pressure drop. When you observe the bottom entry of the valve, the stem is precision machined with a live loaded Teflon® thrust washer for a smooth transitioning when temperatures and pressures arise. 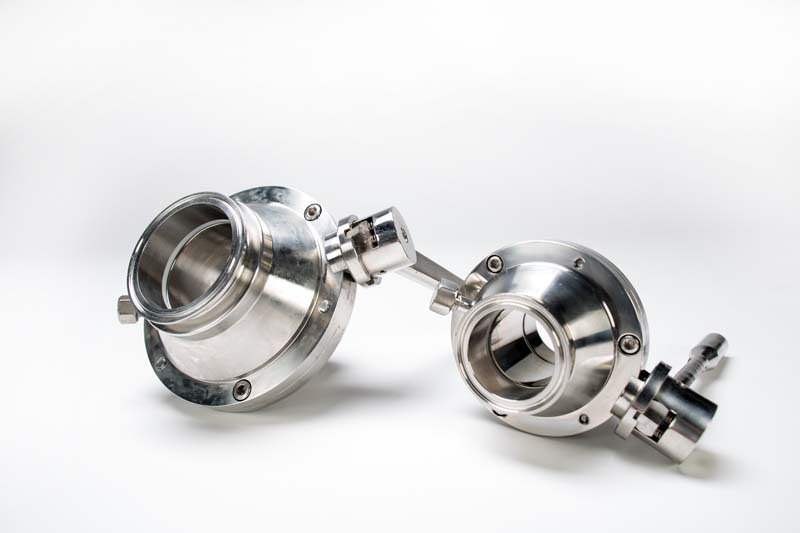 Our dual purge port ball valve is constructed with a full port positioned inside the valve body between two flanges and two Teflon® valve seats. The ninety degree rotation of the valve stem when turning the handle end transfers to the ball to open or close the ball. Since this dual purge port ball valve comes standard with a clamp end, it is easy to assemble and disassemble when cleaning or working in a tight space. As for the wetted parts of our T304 Two Way Ball Valve, the ID finish of ball and ports are to a 25 Ra ID. Sanitary Solutions T304 Dual Purge Port Ball Valves come standard with a fully encapsulated or cavity filled seat-- this is not an option since the fully encapsulated Teflon® seat reduces the threat of contamination for critical processes or products. Our Dual Purge Port Ball Valves require no special tools in the field to work on the valve, which is a plus when it comes to easy maintenance and low installation costs. We have each valve capped and bagged so you have no dings on the ends as well as permanently etching the size, alloy and heat number for full trace ability. Upon downloading the PDF Valve Sheets on pages 22 & 23 in our "NEW SANITARY SOLUTIONS VALVES/PRODUCT RECOVERY SYSTEM CATALOG", take a moment and review the weight for the 1.50", 2.00", 3.00"and 4.00" size valves that we stock. JUST ADDED: we have added the 1.5" and 4" sizes of repair kits to round out our current inventory of this product offering and stock 1.5", 2", 3" and 4". Please keep in mind that the maximum pressure is 200 PSI maximum and the temperature range is 60 degrees F to 300 degrees F. The purge port connections are 1/4" Male BSP. Our sales team can assist you with stock availability, valve questions, repair kits and pricing on the ( 1.5"-- 4") Dual Purge Port Ball Valve when you call either 1-888-909-3569 or 1-855-640-7871.